In the Skyrim modding community, the ideas and creations of mods by other players are amazing. They allow you to build a Skyrim to your taste and play style. From hard-core to the very delicate, the player can create their game in many ways based upon the various mods that are available. If you played Skyrim then you are aware of how large the game is. Add a few mods here and there, now Skyrim is much larger with added player made content. This story is based upon one mod (OBIS – Organized Bandits in Skyrim) and one Skyrim NPC written by members of the Mod Maidens. It centers around a bandit hunter and an ex-bandit. 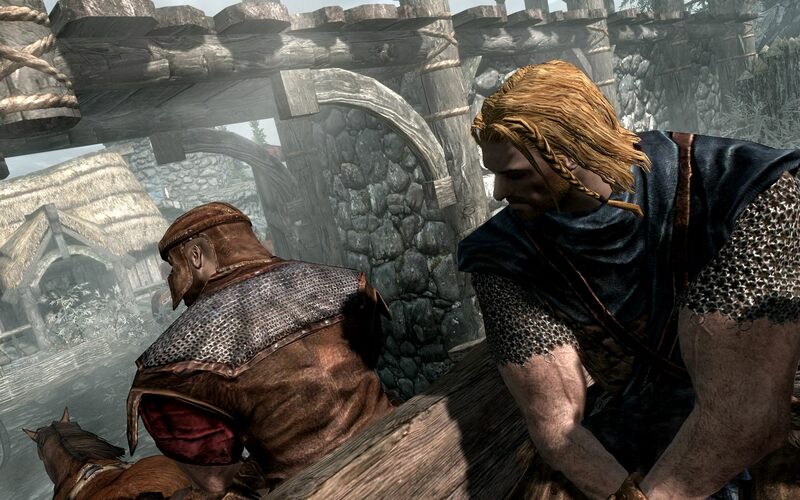 At the beginning of the game, you are in a wagon cart as a prisoner with no clear reason as to why you were in Skyrim. Ralof does tell you that the guards captured you at the border but still you are left with that void. As role-players, we tend to like having purpose and history to our characters. One OBIS agent was sent to Skyrim to hunt down certain bandits but the moment she stepped foot there complete chaos and havoc set in. She was told by her boss Indigoblade to find the ex-bandit from Riften. As players of Skyrim know this NPC is Thrynn from the Thieves Guild. While Thrynn is not a normal NPC as one that cannot be used for a follower through some magic and mods he can become one. Thrynn is much younger in the story than in Skyrim and a very tall, muscular man. Otherwise, he is still that grump you find in the game. We always found it interesting that he offered to help you when you first speak with him then bites your head off for speaking to him every time after that. Even more puzzling is why the Thieves Guild that had all the good-looking men and not a single one of them could be married or used as follower. In our story, the player character does not complete the first quest by following either Hadvar or Ralof out of Helgen. She was escaping with Ralof but passes out in the building when Imperials attacked inside. The story starts when she is rescued and cared for at the Stormcloak camp near Helgen and Ralof is nowhere to be found. The story follows the OBIS agent as she tries to do her job while searching for Ralof. This is for entertainment purposes only. All of the material on this site has been gathered and submitted by the Skyrim players of the Mod Maidens. Skyrim is a registered trademark of Bethesda Game Studios. This site has no official connection with The Elder Scroll V: Skyrim or Bethesda Game Studios. All information, articles and graphics on this site are the copyright of The Mod Maidens, its owners and/or Bethesda Game Studios and may not be copied or reprinted without the express written approval of the copyright holder. Thanks for stopping by and hope you come back for more Skyrim fun Mod Maidens style.